Enjoy an enriching two-night city break in Berlin, experiencing the diverse culture of the German capital, before taking the classic passage of the Main, Rhine and Moselle rivers across Germany. Welcome to Berlin, Germany’s capital city has a lot to offer, from entertainment, to museums and architecture. This metropolis is a combination of modernity and history. Included is a two-night stay in Berlin. Your exciting morning starts with a guided tour of Berlin passing by the famous Alexanderplatz, to the Berlin Cathedral, the Television Tower, the Brandenburg Gate and the Berlin Wall. The afternoon is free to continuing enjoying Berlin’s iconic sights, its vast swathes of green, its sky bars and chic restaurants. Today you will fly from Berlin to Frankfurt, where you will be met and transferred from the airport to your Emerald Waterways luxury river cruise ship. This evening, join your fellow travellers for dinner on board. Your Cruise Director will also conduct a port talk to review the activities and itinerary for the days ahead. Arrive in Rüdesheim, one of Germany’s most popular towns. Your included tour will be a visit to the Siegfried’s Mechanical Musical Instrument Museum. Continue exploring and taste the famous “Rudesheimer Coffee”, made with Germany’s most famous brandy Asbach Uralt. Tonight, the Captain will be delighted to host the Welcome Gala Dinner. Cruise to the 2000-year-old town of Koblenz, which is situated at the confluence of the Rhine and Moselle rivers. You will have a tour of Koblenz and the chance to visit the Ehrenbreitstein Fortress on the opposite side of the river. This fortress was part of the Prussian defences against the French in the 19th century and later used as a headquarters for the American military during WWII. Continue sailing to the town of Mannheim, located at the confluence of the Rhine and Neckar rivers. There you will have a chance to either visit the medieval town of Heidelberg including the impressive castle which overlooks the town or take part on an active hike to Heidelberg Hill. 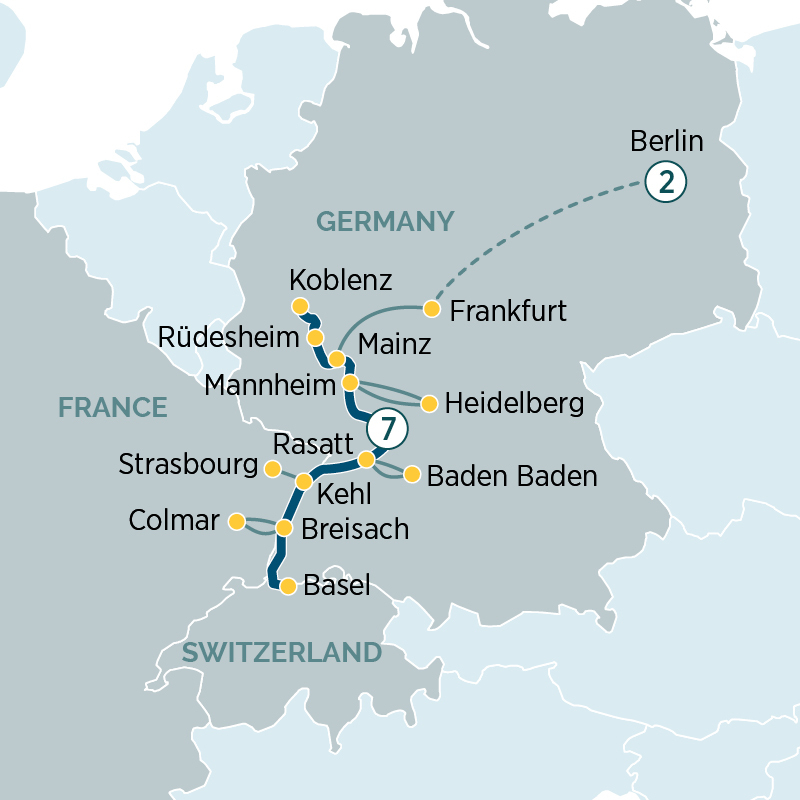 Sail into the Rhine-side town of Rastatt and journey to the hidden jewel of Baden-Baden. Nestled in a beautiful landscape along the border of the Black Forest, Baden-Baden was settled by the Romans, with ruins dating back to 210A.D. Enjoy a guided walking tour followed by free time to stroll the historic Kurhaus Colonnade, shop the elegant boutiques of the old town or join EmeraldACTIVE guided hike to Hohenbaden Castle, known locally as Altes Schloss ‘Old Castle’. Once docked in Kehl you will be transferred by coach across the river to Strasbourg, the capital city of the Alsace Region in France and official seat of the European Parliament. In Strasbourg you will have a canal tour on a “batorama” passing by many attractions of the Alsatian capital, in particular the famous Petite France and tanners’ quarter, the Covered Bridges and the Vauban dam, the Neustadt imperial quarter, and some European institutions. Begin your magical morning with a tour to Colmar, a town fill of half-timbered houses, flower-decked town centre, cosy streets and lively restaurants and shops in the Alsace region of north-eastern France. The city is renowned for its well preserved old town, numerous architectural landmarks and museums. Enjoy a guided city tour passing the Unterlinden Museum, the Maison des Têtes, Minster of St. Marti and the little Venice quarter. Alternatively, join EmeraldACTIVE guided bike tour. Welcome to Basel, the centre for Switzerland’s pharmaceutical industry. After breakfast, disembark your ship and transfer to Basel airport for your onward or homebound flight.